France will consider invoking NATO's collective defense clause, according to security expert Bruno Tertrais. Speaking with DW, he also said that Paris-style attacks could happen in every major Western city. 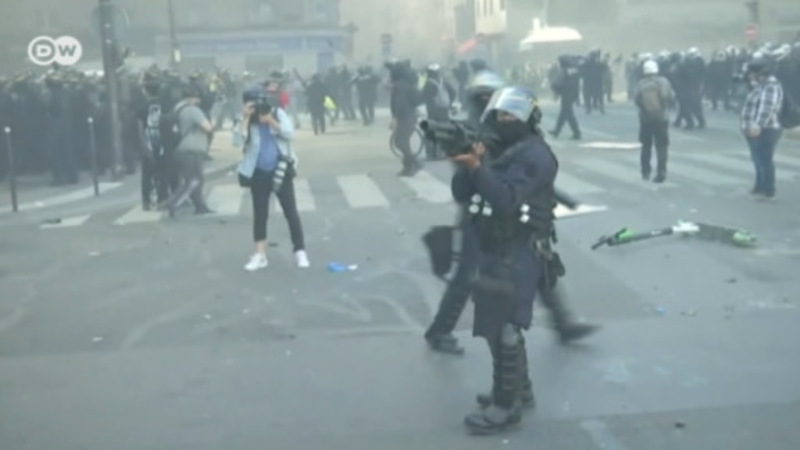 DW: What is your assessment of the Paris attacks, the worst terror attacks in French history? Bruno Tertrais: It does not really come as a surprise. All the intelligence services and police knew that a major attack of the kind we had yesterday was not only possible, but almost likely. It is the kind of attack that police has tried to prevent for several years now, but it was absolutely not a surprise. Of course, it was a huge shock, especially because of the simultaneous nature of the attacks and the fact that for the first time ever, we had suicide bombers operating on the national territory. "Islamic State" (IS) has claimed responsibility for the attacks. This has been confirmed by French President Francois Hollande. Do you hold that claim for credible? I hold it for perfectly credible for several reasons. First of all, the speed at which French authorities blamed the so-called "Islamic State." They would not have done so if they did not have clear elements pointing to the responsibility of IS. Moreover there were signs yesterday night that there was a connection with Syria, as one of the perpetrators did mention Syria during an attack. The only remaining question is whether these were foreigners, French nationals or a combination of both. This will become known in the coming days. You mentioned that it was the first time that suicide attacks had occurred in France. What does the way the attacks were carried out tell you? It's the combination of a new modus operandi, the suicide attack, with the number and coordination of the attacks which is particularly troubling and shocking. But that is not even the worst thing. The worst thing is that they could be testing us for an even bigger attack; at least that is a hypothesis that some of the intelligence services are working on right now. This tells me that there is both the intent and the capability to try to do serious harm to the French republic. And if they were able to do that yesterday night, they unfortunately are able and likely to do it again. And I am certain that the French government is also working on that hypothesis. This is the second major terrorist incident in Paris this year, after the magazine "Charlie Hebdo" was attacked in January. How will France cope and react to the second bout of carnage in its capital? It's a bit early to say. I would say that the French reacted admirably well to the January events. I don't know how they will react to the second series of attacks, which is in a sense much, much more horrifying because of the targets. The targets were, for the most part, just people who were going on with their everyday life. Young people sitting in cafes or eating in restaurants. For the moment the French population is reacting fairly well. There are no spontaneous demonstrations or bursts of outrage. The big question is of course whether the National Front and Marine Le Pen will be able to capitalize politically on these events, which they were not able to do in January. At this point in time, this remains an open question. Is there a special reason why France is being attacked, or could this happen anywhere? That is a very good question. I would say that the sort of attacks that happened yesterday night could happen in every major Western city. However, "Islamic State" claims that it has particular reasons to attack France, which was allegedly one of its first priorities, if not the first in terms of targets. There is the fact that we are seen as a secular country that has biases against Muslims. I am not saying that this is a correct perception, but it does exist, especially because of our laws against ostentatious and visible religious signs in the public space. And there is also the fact that France is playing a leading role in the coalition against "Islamic State" in Syria in particular. These are key reasons, or at least key rationales. But I am not persuaded that we wouldn't have been a target even if we were not present in Syria. How should the West, should Europe, now confront the terrorist threat? We are talking about a multi-pronged response which will not only be military, or perhaps not even primarily military. But I believe it is now time for a united front in Europe and along with our NATO allies to see whether we can coordinate better and act more vigorously against the jihadi terrorist threat in all its components. One of the things that will be discussed in the coming hours and days is whether or not the clauses of solidarity which exist in EU treaties and in the NATO treaty's Article 5 should be called upon and put into effect. Certainly on the French side, there is a hope that our European friends and allies will also contribute to the military action against "Islamic State" in Iraq and Syria in a more proactive way. Bruno Tertrais is a senior research fellow with the Paris-based Fondation pour la Recherche Strategique (FRS), a French think tank on international security issues. Previously, he served in several roles in the French government, including as head of the Defense Policy Planning Unit in the French Ministry of Defense.